Some pictures just look like warm, yummy food to me. 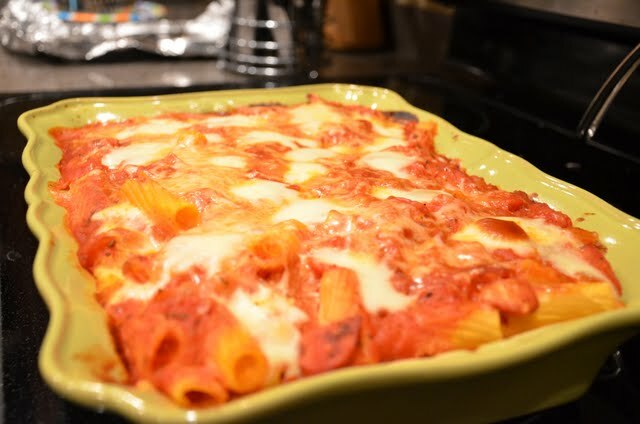 Read – melted, delicious cheese and pasta. Yes, please, and thank you. Corrie is generally less interested in “simple” pasta/sauce/cheese dishes, so he usually thinks these kind of pasta combinations are just okay, but this one turned out particularly well. It came to mind the other day as a possible option to take to my friend who has a beautiful new son. I ended up taking some other things though, one of which her little girl reportedly was a big fan of, so I’ll be sharing that recipe shortly. 😉 This is a perfect meal to feed a crowd. Adjust oven rack to the middle of the oven, and preheat the oven to 350° F. Whisk cottage cheese, eggs, and 1 cup Parmesan together in a medium bowl; set aside. Bring a large pot of water to boil. Stir in 1 tablespoon salt and the pasta; cook until pasta begins to soften but is not yet cooked through, 5-7 minutes. Drain the pasta and leave in colander. Meanwhile, heat olive oil in a skillet over medium heat. If using, crumble in the turkey sausage or ground beef, and cook until nearly browned. Add in the onion and garlic and continue to cook until the onion is softened and the meat is completely browned. Stir in the tomato sauce, diced tomatoes and oregano; simmer until thickened, about 10 minutes. Off heat, stir in 1/2 cup basil and the sugar, and season with salt and pepper. In a small bowl, stir together the cornstarch and heavy cream. Transfer the mixture to the now-empty pot over medium heat. Bring to a simmer and cook until thickened, 3-4 minutes. Remove the pot from the heat and add the cottage cheese mixture, 1 1/2 cups of the tomato sauce and 3/4 cup mozzarella. Stir to combine. Add the pasta and toss to coat thoroughly with the sauce. Remove foil and continue to cook until the cheese is bubbling and beginning to brown, about 30 minutes longer. Cool for 20 minutes. Sprinkle with the remaining 2 tablespoons basil and serve.